As Romantics we consider French the language of love and I am no exception. We pride ourselves with time keeping and providing you with the ultimate wedding experience, from virtual to reality. A unique service offered to our clients, is a personalized spending plan based on your unique budget. We design flower bouquets and provide stylish decor with elegance and sparkle to suit your lifestyle. 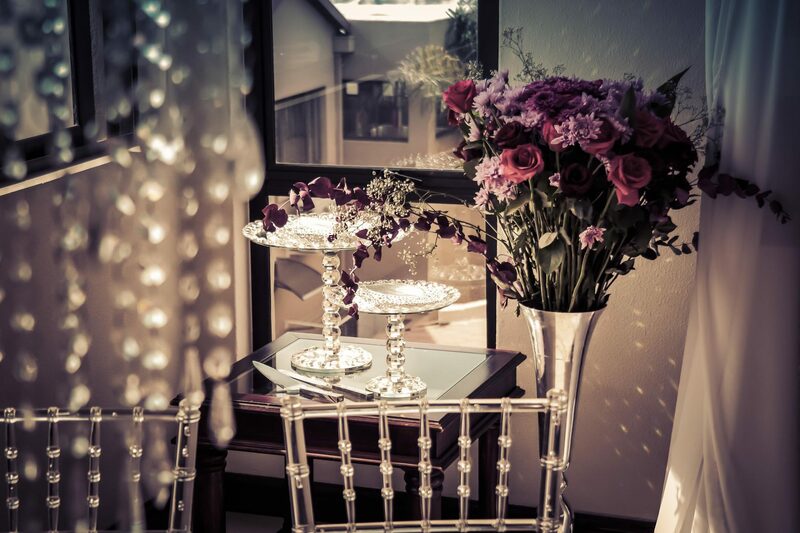 Our decor elements and bespoke flower arrangements are unique. We can supply decor and floral bouquets to you, or if you prefer, from “Je’taime” all the way to “I do” we available to design your wedding with class. We at Dazzling Events are passionate about your love stories, Our flawless princess brides, their visions are turned into wedding fairytales. Having spent 15 years in management in the world of corporate giants, the likes of Arthur Anderson, KPMG and Bidvest I can honestly attest to the importance of time management, stringent deadlines and expenditure within budgeting parameters. Like a work of art we tirelessly take the blank wedding canvass and fill it with colourful wedding elements giving you a masterpiece wedding, as our superb team draws on eamlessly from their electric talents. From the fine details to the gorgeous cascading flower centrepieces our team collaborates well to deliver state of the art weddings . For the discerning bride, a beautiful garden wedding, or change of vows on a exotic beach island, or perhaps a laid- back, yet styled Boheimian theme. Whatever your dream is, we will execute it with style as our talented team gets their creative juices flowing. We are a perfect fit for clients colloquial, savvy, congenial, trendy and sophisticated. You name it and we will create, texturize and deliver timeously as we infuse all the wedding ingredients to leave a sweet lingering trickle of wedding memorabilia. Our client base is all couples seeking a fun event with the glitz and glam and a touch of sophistication. We keep up with the latest fashion trends for the new fangled bride, so you don’t have to. Take a look at some of our decor designs then give our wedding designers a call to help you plan your wedding reception decor. Remember that we can tailor make packages that can be revised to suit your specific requirements. View our gallery on our different social media platforms, below are the addresses provided.